Model wears size M. Her height is 170 cm a her weight is 55 kg. We designed Malmo W Pull for use as a base or middle layer of the insulation, at moderate temperatures and in the absence of strong winds it works great as an outerwear. Polartec® Classic 100 microfleece is highly breathable and dries quickly. Half-length zipper with chin protection allows you to quickly and effectively adjust the ventilation if necessary. Pullover is equally suitable both for outdoor and leisure activities, as well as for everyday use. POLARTEC® Classic 100 microfleece is light. warm and quick to dry. Elastic trimmings along sleeve hems and bottom hem. Embossed plastic zipper pullers are easy to grab. The fleece materials may be washed in washing machine with the program for synthetic fibres at the temperatures of 30-40°C according to textile care symbols stated on the product label. These products may be washed by usual liquid laundry agents. Solid laundry agent use is not recommended. The washing agent shall not consist of bleaches and brightening agents. Water softeners and fabric conditions are not to be used. The washing machine drum shall not be filled completely, between the clothing in the drum and the drum top, a gap of minimum 10 – 15 mm shall be remained so that enough space for clothing movement to prevent from clothing crumpling will be available. If not special application is located on the fleece, it is possible to dry the products in a dryer at low temperatures, select the program “sport clothing”. The fleece products with threads are not to be ironed not even at low temperatures prevailingly because the thread will be “slack” and so the material loses its insulation properties. If you are sure that your product has to be ironed inevitably, use either vertical steam iron or classical steam iron with suitable steam pressure. Put a cotton textile between the iron and the product. The iron put on the surface of the cotton textile slightly do not generate a pressure and steam the product only. Pressure and temperature of the steam assure the product ironing. All fabrics pill to some degree. 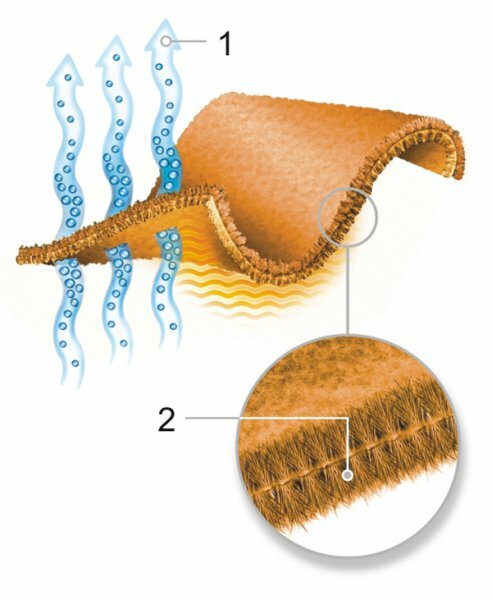 When compared to a short-fiber fleece, brushed fleece is more comfortable against the skin but more susceptible to pilling. Pilling will not affect the comfort or performance of ZAJO brushed fleece.